IS IT A DECLARATIVE SENTENCE (Y/N)? ARE THERE ANY 'UNASSIGNED VALUES' (Y/N)? A PREPOSITION IS A DECLARATIVE SENTENCE WITH NO UNASSIGNED VALUES. DO YOU THINK IT IS A PROPOSITION (Y/N)? Book’s value is 2.7182818 and I get 2.71828198. Pretty close! Somewhere before the deep end, I am writing Fortran code. If the input were read in on a card, it would really be just a line of digits. The assumed decimal places are specified by the first FORMAT(); “assumed” as in does not count toward column positions. 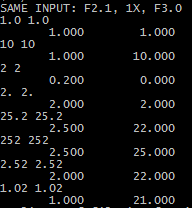 The second FORMAT() specifies printing position, and this time the decimal point does count toward column position.